"What our students read in school is important; what they read the rest of their lives is more important." High school teacher and literacy coach Penny Kittle knows something that many English teachers don't: kids don't actually read the books they're assigned in class. And far too many kids are graduating from high school not having experienced the joy and pleasure of living inside the pages of a book, let alone many books. And that's just the problem. Administrators, curriculum writers, and law makers assume that in order for students to become better readers they must only read intensively and not extensively. They forget that in order to become expert readers, students must build stamina. They can only do that by reading. A lot. Sometimes even books that are too easy for their reading level. And that's where the expertise of the teacher comes in: when do you pull back and let students experience the joy of some "brain candy" and when do you decide the right moment to challenge their thinking and give them a "reach book" as Penny likes to call it. You see, Book Love my friends, is a revelation. It belongs up on the pedestal where I hold The Book Whisperer. While reading it can benefit teachers of any grade, and I highly encourage every teacher to pick it up no matter what grade you teach, Penny addresses the contention most high school teachers seem to have that reading and writing workshop is just a "middle school thing." Not only does Penny show that workshop absolutely belongs in the high school classroom, but she allows us to see that it's a necessary part of the high school English and literature experience if we are to prepare our students for college and careers beyond the classroom. 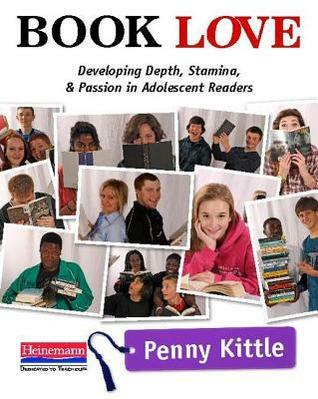 Filled with concise, logical arguments as well as emotional stories of Penny's own students to drive her points home, Book Love should be required reading in every high school English department across America. I finished reading the last half of this book on the plane home from NCTE thinking that it would be safe plane reading. Oh how wrong I was. I shed many tears for Penny's students in the last few pages of this book. Her love and commitment to them made me wish to be the teacher to my students that she is to hers. This is a book that is impossible not to think of the Maya Angelou quote (and I'm paraphrasing here): when you know better, you do better. Teachers, read Book Love. And then when you know better, do better for your students. They deserve so much more than the fake, passionless reading they are currently experiencing in classrooms across America. Get them out of the those SparkNotes and into the pages of a real book. LOTS of real books. Let them read widely and voluminously so that they can become lifelong readers. Fill your shelves with many different books, not just the handful of classroom sets of classics that don't even get opened when you "read" them in class. Give them a buy in. Let them drink the Kool-aid. Then and only then will those dusty classics sitting on your shelf seven months of the year actually get read. Oh, and if you don't believe that students don't actually read the books they're assigned in class, I dare you to continue to feel that way after you watch this video. I'm glad this came to you at the right moment, just like this book did for me. Thanks Beth for this book review. My teaching partner, who is an English teacher is under fire because she is teaching what the kids want and giving them variety and not adhering to the standard curriculum. I have been struggling with how to support her and I am going to show her Penny Kittle's video and send a link to the women who are making her teaching life miserable right now. Incidentally, I am a high school social studies teacher and have an overflowing bookshelf of books for kids to read and they do. They come and borrow them and some I never get back. I also read aloud to my 9th grade classes and many kids stated that it was the only book they "read" all year. So sad. Thank you for Sharing Laura. More people need to take the stance your teaching partner is taking. As penny says, "I teach students, not curriculum."